The statement of the Koran reproduced above provides a detailed map of quasars and their location within a galaxy. For those who study the “light” in the heavens (the context of the Koranic statement), the astronomers, the description given by the Koran is very clear and easily discernable. 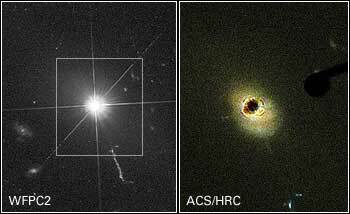 Quasars or Quasi Stellar Objects were first discovered in 1963 (over 1400 years after the Koran). They represent the brightest objects in the Universe. Astronomers discovered that certain faint “star-like” objects existed in the Universe that due to their large redshifts must lie billions of light years away and emit massive amounts of energy, in order to still be visible. In the most widely accepted model of quasars, they are described as the bright nucleus of an active galaxy powered by a central black hole. The black hole is the “niche”, as the Koran states, wherein is the quasar, i.e. “the lamp”. The Quasar is powered by the black hole when “stars and gas” from the galaxy are sucked into it. A “tree”- the Koran states, powers it. It is not unusual for astronomers to describe galaxies as “trees” comprised of stars, see the Hertzsprung-Russell diagram, reproduced in the Timothy Ferris book mentioned above (Ferris 1997: 188).